I am a big fan of using literacy to build language. 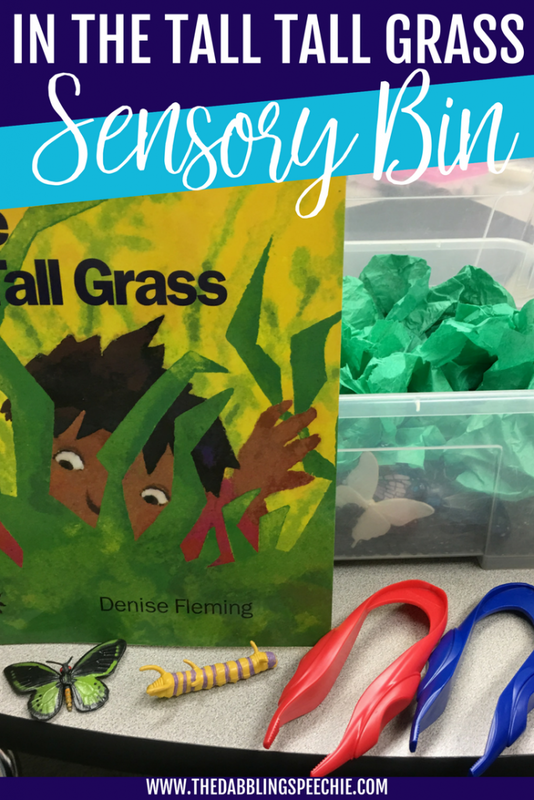 As an extension activity, you can make a sensory bin that uses elements from the book In The Tall Tall Grass (you can find this book on amazon). A bin or container of some kind. The Dollar Store has metal tins or you can find a container at Target that has clasps. Small insects that you can find at The Dollar Spot, sometimes Target Dollar Spot, at Michael’s where they sell Toobs or on amazon with the insect Toob set, rabbit and frog in the Pet Toob, a bat from the Wild American Toob set, and the bird toob set for the hummingbird. For all you SLPs on a budget, you can find printables from the book at Simply Speech and use those in the bin. Another way to make “grass” for your sensory bin is to dye pasta green. I posted a quick video tutorial on my Facebook Page that you can watch and see how easy it is to make! Can you think of any more functional articulation carrier phrases? 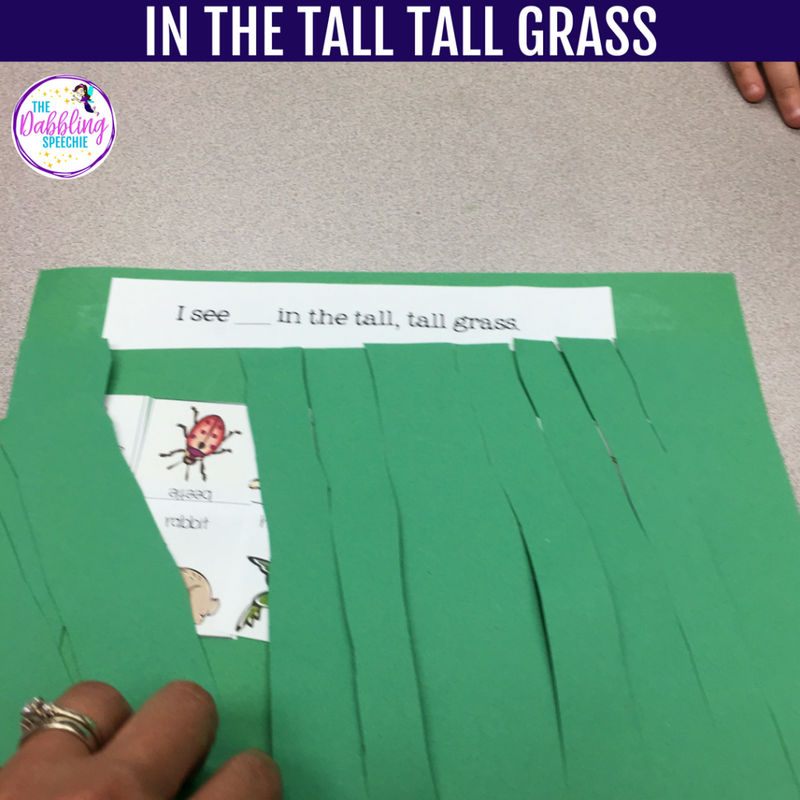 Story retell – Work on answering questions from the story as well as retell what bugs and animals were seen in the tall tall grass. Grammar – Work on the verbs: hide, fly, crawl and see while playing with the items in the sensory bin. Vocabulary – Have your students describe the insects/animals by attributes. Sort the insects and animals into two category groups. Or classify the objects by the insects/animals that can fly/have wings vs. those that crawl. Basic Concepts – Target the concepts in/out, above/below, and next to with the insects and animals in the bin. Functional Communication – Work on initiation, turn taking, requesting for items, making comments, protesting, sharing opinion or asking to be “all done” with an item. 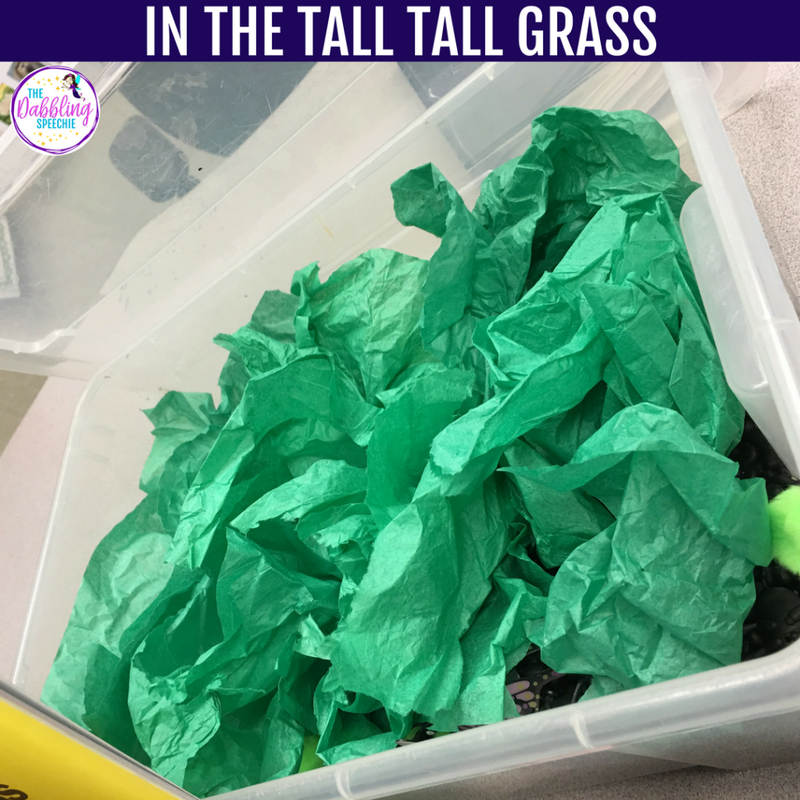 If you want to make a hands on craft with the In The Tall Tall Grass, you can head over to Simply Speech on her easy tutorial and free printable for the craft. Speech Room News has a blog post with a similar craft too. I use this craft every year! How would you use these sensory bin in therapy? What other spring books or sensory bins have you used? I would love to know!! Need more sensory bin ideas? Check out all my sensory bin resources and therapy ideas on my Sensory Bin page or you can follow my sensory bin board on pinterest.